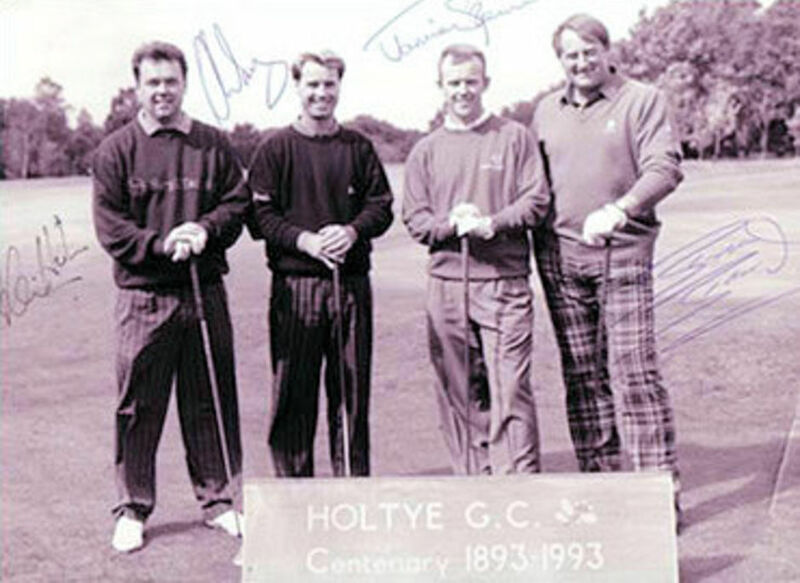 One of the most exciting golfing events that took place to celebrate the Club's Centenary Year was an 11-hole exhibition match featuring our own Pro Kevin Hinton and some very famous names, all Sussex-based Golf Professionals. Jamie Spence, another Nevill junior and a current top player on the European Tour. Over 100 members braved deteriorating drizzle to watch a keenly contested 'skins match' where each halved hole sees the cash fund double up to the next hole. The holes were halved one by one, each Pro playing his part along the way until the home Pro stood anxiously over a 6 footer on the 8th hole. The partisan crowd willed the ball into the hole for an unexpected victory for Kevin, albeit a very rewarding one. Brian Barnes mopped up the balance of the prize money by sudden death at the 11th hole before conducting an auction on behalf of Charity. A very memorable day enjoyed by all present.